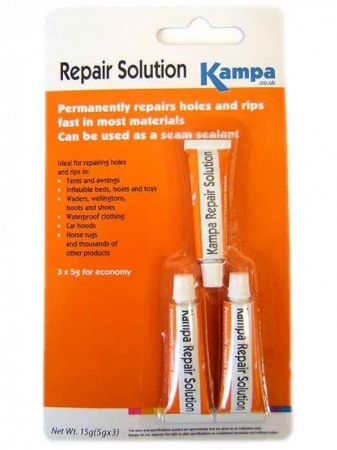 Repairs holes and rips in a great deal of materials. Can also be used as a seam sealant. The Kampa Repair Solution will adhere to a great deal of surfaces for a fast, strong and durable repair. It is ideal for sealing and repairing holes and rips in tents, awnings, inflatable products such as boats, toys and airbeds and self inflating mattresses.